A female candidate for the New National Party (NNP) who will be contesting a seat for the upcoming general elections, has disclosed that she will be taking legal action against the National Democratic Congress (NDC) candidate who has accused her of misappropriating public funds. 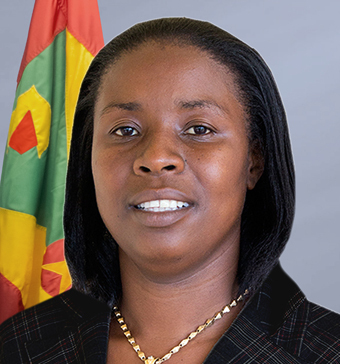 Delma Thomas who will be contesting the St Andrew North West constituency said that her name was slandered by her opponent Phillip Alexander during a public meeting which was carried live via Facebook, and has promised her supporters that she will be suing him for defamation. “Brothers and sisters, you cannot accept slander; you cannot accept propaganda as politics; it’s not politics; let us discuss the issue,” Thomas said in her remarks during a meeting, as she accepted to become the NNP candidate for a third time for the constituency. She lost the constituency in the 2008 general elections but won it in 2013. “I have my good name and children to protect,” she told the meeting. Phillip who is contesting the constituency for the first time, in a recent public meeting accused Thomas of misappropriating funds allocated to Members of Parliament to operate their offices. The funds, according to Estimates of Revenue and Expenditure, fall under the administration of the Ministry of Finance and are assigned for the payment of staff, utilities, and other miscellaneous needs for the smooth operation of those offices. In the meantime, the NDC as a party and its leader Nazim Burke are also facing some legal challenges from a young lady and her 2 minor children who appeared in a promotional 2-minute video for Burke. The young lady is claiming that the video which shows her talking with Burke in the waiting area of the Carriacou Hospital violates her moral rights because she never gave consent in writing or verbally for her image to be used in the promotional message. 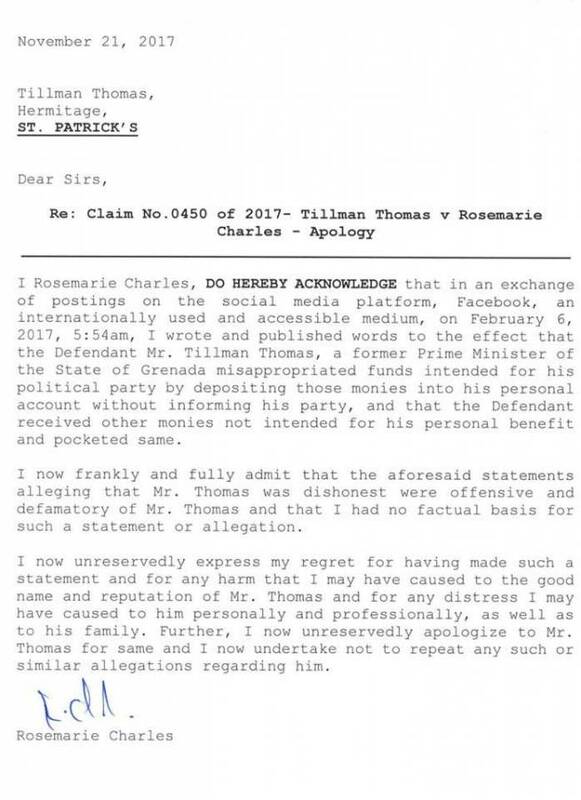 Just recently, Rosemarie Charles, a known activist for the NNP, issued a letter of apology to former NDC Leader and Prime Minister Tillman Thomas for defamatory remarks she posted on her Facebook profile in February 2017. In her apology, which she also posted on Facebook, she said that her words in which she accused Thomas of misappropriating funds were inaccurate. “I now frankly and fully admit that the aforesaid statement alleging that Mr Thomas was dishonest were offensive and defamatory of Mr Thomas and I had no factual basis for such a statement or allegation,” Charles said in her letter of apology.